Make the most of our short summers and maximize the functionality of your outdoor spaces with our comprehensive approach to landscaping. Give us an idea of what you need in your backyard or commercial property to make the summer a memorable one. Your paver patio can become an extension of your home with many customized features, from fire pits to cabanas, outdoor kitchens to aquatic gardens and much, much more. Choose a landscaping company that can help you create a shady oasis surrounded by natural greenery. Our design team can provide you with a peaceful waterfall and a pond filled with colorful fish and water flowers. Or if you love food, we can add a vegetable garden and outdoor kitchen to your property – except for a steak, you’ll have everything you need to eat like kings right in front of you. If you are ready to define your outdoor spaces with pavers and other hardscape installations, our team is ready to get to work. Our customized design process ensures you get a say in how your new outdoor living space looks. Set your home or business establishment apart from the rest, and create a destination that neighbors and friends will look forward to visiting. Save time and money by working with an experienced team that has a track record of success. A full-service landscaping company like ours is here to provide you with a comprehensive design plan for your entire location. Maximize the value of every inch of your lawn with our cost-effective options including decks and gazebos. Your backyard has the potential to become so much more than just a plot of land adjacent to your home. Soak up the sunshine while you can with a new patio or gourmet outdoor kitchen. Your living space can become the place to be in the neighborhood when the days get longer and the temperatures rise. Our design specialists can also suggest a broad array of plants and shrubs that are best-suited to our winter conditions. 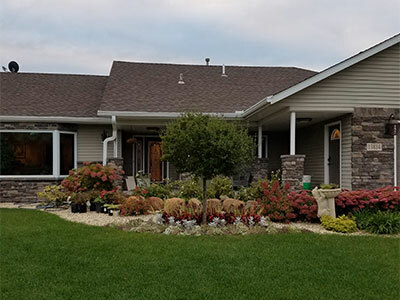 Our experience in landscape planning and design makes a big difference, as we know the right plants to use and the right places to position them for optimal growth and care. Add a dash of color to the winter landscape with Redosier dogwood, while creating natural boundaries with pruned boxwood. Define your own landscape design with water features, retaining walls, and much more. There is nothing quite as relaxing as the sound of moving water; adding accent fountains and winding streams can give you the sound and ambiance you want. Our landscaping professionals have the right tools and affordable products that make any outdoor dream a reality. We can even create a flat and safe surface for a swing set using boulders and retaining walls. When your guest and neighbors arrive for any function, they can walk about your outdoor landscape on stone sidewalks and driveways made from pavers and stones that you select. This gives your home a special look that a standard poured-concrete driveway just can’t match. Contact us today to make the most of our short summers with a new landscaping plan from BDI Outdoor Solutions. Enjoy the sun, see some greenery, and eat some good food with your friends and family. We proudly serve customers in the metropolitan areas of Minneapolis and St. Paul in Minnesota, and surrounding communities.